I received an anonymous request through this blog for more pictures of the 9x color. So here you go. Keep in mind that the blue isn't in the 2009 catalog because it was MIA during the photo shoot for said booklet. 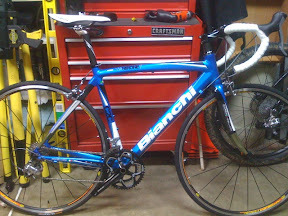 Take note too; the bar tape is white not black as shown in the photo below. The color seriously has some pop to it. I still roll my bike with the Queen's green (celeste) but this blue is a rad alternate color.